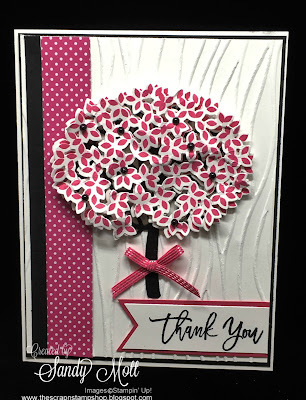 I just can't get enough of the Thoughtful Branches stamp set. My first reason for using this set today was that I needed a quick thank you card. I decided to get back to one of my favorite color combinations - Melon Mambo, Whisper White, and Basic Black. But since there is only 4 more days for you to order this set, I decided to show you how versatile it is and made #2 and #3 reasons - a Halloween card and Treat Bag, and a Christmas card. 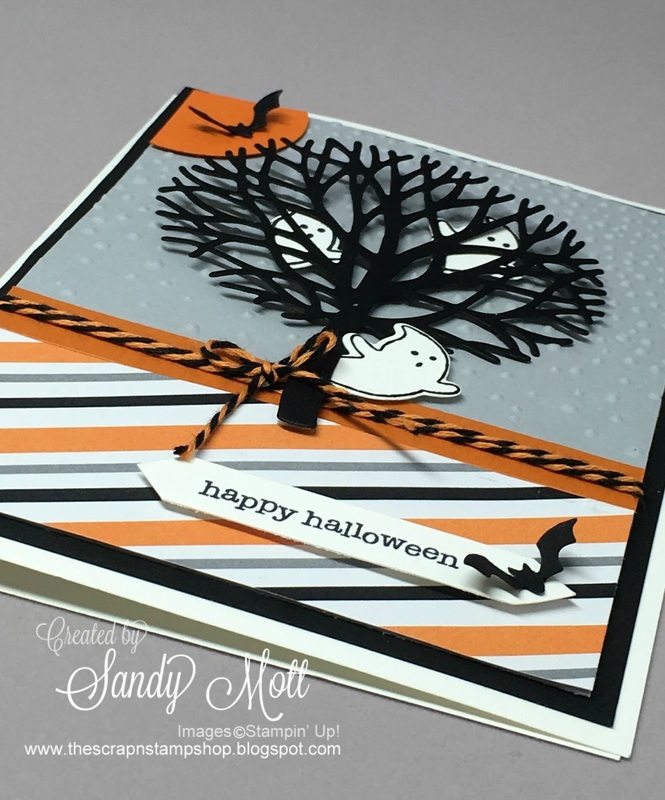 I was so happy with the Pop of Paradise Designer Series Paper because it contains my favorite color combination - Melon Mambo, Basic Black, and White. I added an extra layer of leaves and scrunched it up to give it some depth. I then colored some pearls black with a Sharpie and added them to the leaves. 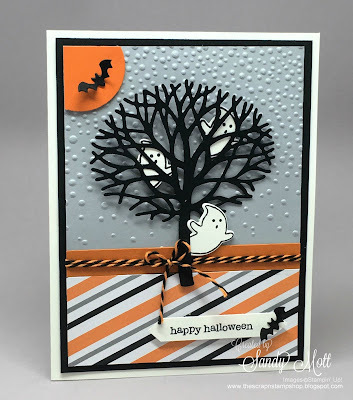 I embossed the background with the Seaside Embossing Folder. A simple bow with the Melon Mambo 1/8" stitched ribbon completed the card. 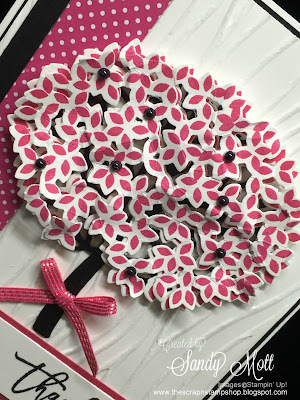 This die is also perfect when you need a bare tree. 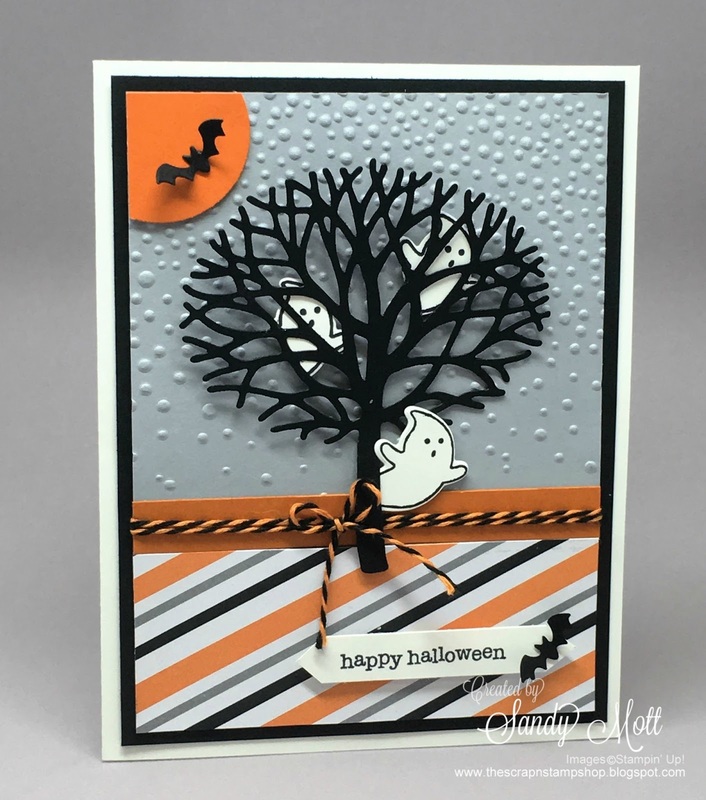 I die cut some ghosts and a few bats from the Sweet Home bundle. I love having the ghosts peek out. I love to bend up the bat wings so they look like they've just landed. As long as I was at it, I made a Treat Bag to match. These little treat bags are perfect for a bunch of Hershey Nuggets. 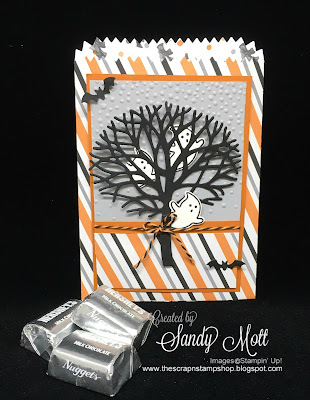 What's Halloween without chocolate? And, finally, my version of a Gumball Tree (lol). Actually, there's a story behind this. I loved candy as a kid (who doesn't!) and when I went shopping with my Mom, of course I wanted candy. Her answer was simple. "Do you think candy grows on trees?" I would say "no", and she would say "Neither does money". So there. Well here's a candy tree Mom! 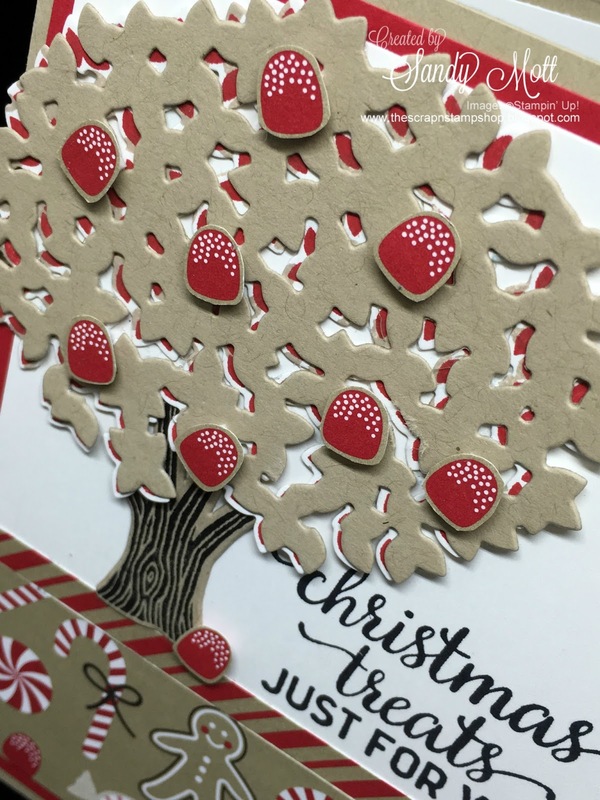 I have seen some gorgeous Christmas cards with this set as well. Check out my 2016-2017 Stampin' Up! 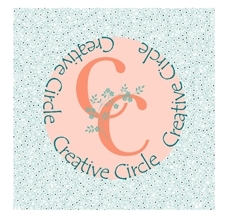 Pinterest page HERE. And if you missed my other Thoughtful Branches posts, click HERE and HERE. This is a set you can use for just about any occasion, so don't miss out. You only have 4 more days to get the Thoughtful Branches bundle (or while supplies last). 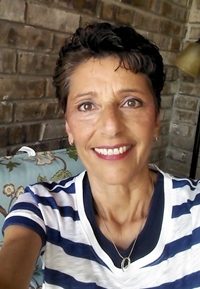 Click on my name to order at my online store and take advantage of my Customer Rewards Program (free cards and tutorials). 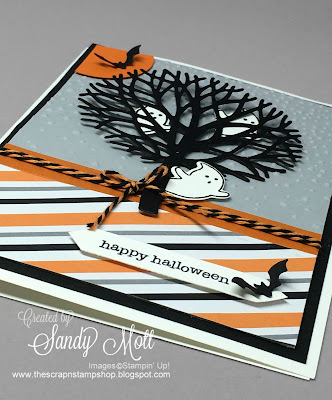 Hi Sandy, I was just surfing around Pinterest and found the beautiful Sheltering Tree card you made on this post. It's gorgeous. I also read your "about me" and am wondering what party your husband is running under for Congress 2018. 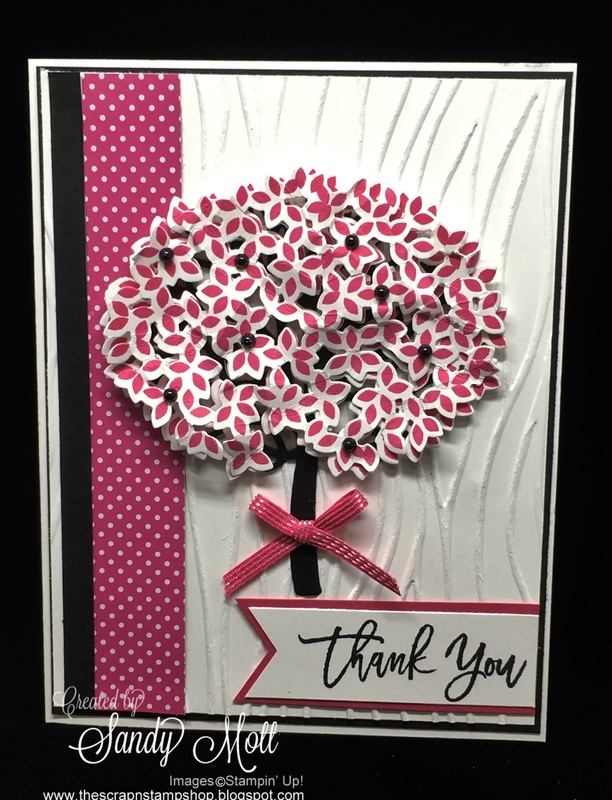 Have a great day and thank you for sharing your exceptional talent with stamping. Hello! Thank you for your kind words. I'm working for a candidate running in the IL 15th District. I have to switch back & forth between my google and his google accounts. Have no idea why his picture ended up there. So sorry! Hopefully I have fixed. At any rate, thank you again!